It is always a pleasure to find an children’s book author who is consistently terrific. 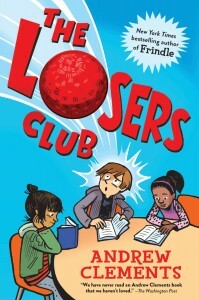 In my small survey, Andrew Clements fits into that category, beginning with Frindle, continuing with No Talking, and now this perfect middle-school children’s book about reading and fitting in. There are so many good things about this children’s book, I’m not sure where to begin. First, perhaps, is the fact that it can attract both middle-school boys as well as girls, though perhaps even more slanted towards boys, as it highlights Alec’s coming-of-age dilemma of learning to deal with girls. That aspect also makes me feel that this works best for 5th and 6th grade, and not younger, as I don’t think kids will relate if they are too young. Another great aspect to this well-written and authentic children’s book is the fabulous selection of other books that are mentioned here. I was not only pleased to see many of them are on this website, but also that there are new ones to add to my reading research. The author clearly knows what works for kids to read, and he also clearly knows how their minds work through problems. The humor and appreciation for kids is present throughout the book. There is some wonderful advice sprinkled lightly throughout the book, about not labeling and judging others, about trusting ones self, and dealing with bullies. It’s all done so naturally that you never feel lectured or spoken down to, and rather are engaged in a fast-moving, light-hearted story. I love this children’s book, and recommend it for anyone, especially avid readers.